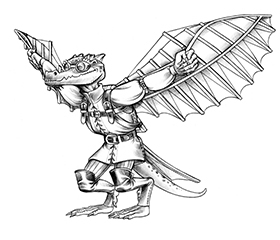 The Midgard patrons are converting new creatures for the AGE System, like this one originally written for Tales of the Old Margreve and Pathfinder RPG. 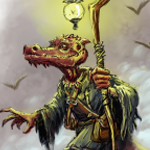 The Midgard campaign setting may be acquiring an AGE System bestiary if this keeps up! Alseid are the graceful woodland cousins to centaurs. Because they are rarely seen far from the wooded glades they call home, they are sometimes called “grove nymphs,” despite being more closely related to elves than nymphs. Alseid see the forest as an individual and a friend. They are suspicious of outsiders who do not share this view. Lost travelers who demonstrate deep respect for the forest may spot a distant alseid’s white tail and chase after it as it bounces toward a road that leads out of the forest. Disrespectful strangers may follow the same tail to their doom. Male alseid have antlers growing from their foreheads. Antlers grow very slowly, branching every 10 years for the first century of life. Further points only develop with the blessings of the forest. No 14-point imperial alseid are known to exist, but many tribes are governed by princes with 13 points. Because antlers signify status, alseid never use them in combat. Cutting an alseid’s antlers is one of the direst punishments an alseid can receive. Elf rangers have reported a lone alseid exile, wandering the Margreve, its antlers sawn off near the scalp. Alseid have a deep connection with the Old World magic of the Margreve. What Zobeck and Midgard monsters would you like to see converted to Pathfinder RPG or AGE System stats? We’re taking a few requests from the comments! All your monsters are belong to AGE! Indeed they are! I think there’s about 4 AGE System conversions complete for Midgard patrons, and many more to come. Looking forward to the first playtest reports. The clockwork constructs from Tales of Zobeck, please! Yeah, that’s a definitely great suggestion. I’ll post it on the patron boards. Actually, I think I meant the Zobeck Gazateer, but either/both would be good. Well, I’m not sure when the Pathfinder edition of the Zobeck Gazetteer will ship. Pathfinder might be my first choice for Midgard, but after reading some articles, I definitely need to be more familiar with Dragon Age – sounds like a cool system! 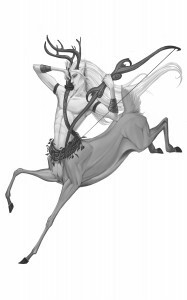 Love the alseid hunters – wonder how centaurs feel about them?